Welcome to the RCIA Catechumens' Workbench! A Catechumen is "one who is being instructed" in the Faith. As a period of time, this stage can be referred to as, the Catechumenate. Each year, the Church welcomes another group of people into the Flock through this most fascinating process. Historically, catechumens are an important part of the growth of the Church and are actively prayed for by the Parish Community. All of this preparation will help you to more fully understand the amazing plan God has had in mind for you from all eternity, how to tap into it, and how to apply it in real life. Be excited and open to God's Will... His Plans are always better than anything we can possibly imagine! This page will serve as a "workbench" for your studies, deliberations, thoughts and prayers as you consider and learn more about the Catholic Faith. You will find a variety of links, images, documents and downloadable study sheets that will help as you advance through the RCIA process toward Full Communion with the Catholic Church. You may not realize it, but you are on an exciting journey! To help you on this road, you should have a map. This RCIA workbench will be that map by offering you helpful guidance, pointing you toward time-tested milestones and providing you with outstanding resources all designed to help you develop in the Faith. All information is reviewed and approved by the priests at St. Michael Church. The Catholic Faith teaches us that in God's Providential Plan there is sufficient grace available every single day for each one of us to live a holy life and thereby be a saint. Seemingly in spite of the trials and burdens we are certainly asked to bear for Christ, a holy life includes a sense of peace and purpose that can only be found in by following Christ. If only we know where to look, what to do and how to ask God for these most necessary graces! Our faith community is interested in helping you reach this most noble goal... so keep reading, studying and praying. You are invited to meet our parish community and begin to prayerfully participate. Above all, be guided by the Holy Spirit and dare to let yourself be transformed in Christ! Feb. 5, "Intro to Catholicism," Ch. 13 and 14. Eucharist, Penance and Anointing of the Sick. Feb. 12, "Intro to Catholicism," Ch 15 and 16. Holy Orders and Matrimony. Feb. 19, "Intro to Catholicism," Ch. 17. Freedom, Morality and Grace. Feb. 26, "Intro to Catholicism," Ch. 18. 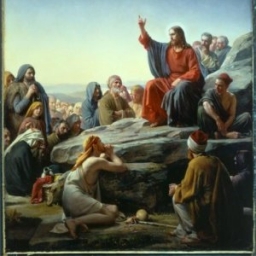 The Decalogue and the Beatitudes.